PDF Squeezer 3.8.1 – Simple-to-use PDF compression tool. 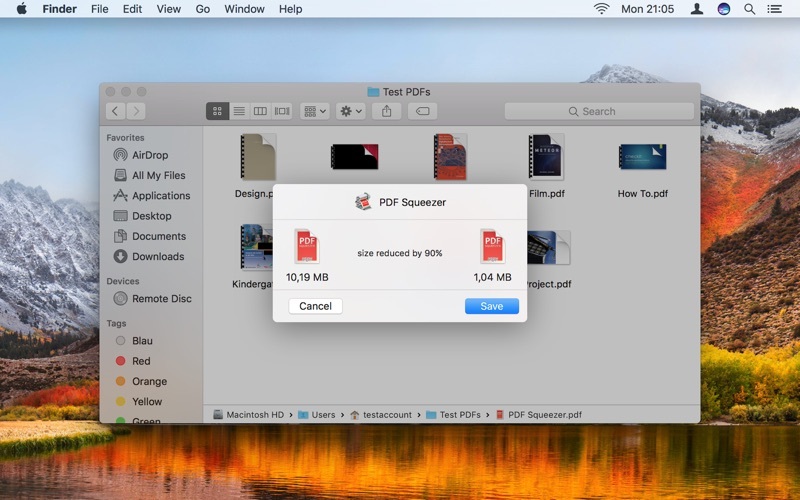 PDF Squeezer is an easy-to-use PDF compression tool. It reduces the size of large PDF documents by compressing images and removing irrelevant information. This will help you obtain important savings in bandwidth costs, digital storage costs and network transmission times. Compressing locked files could confuse the user password with the owner password. Editing a filter only recompressed the selected file, and could cause user interface issues. With One-Click-Compression enabled, the app might quit before the compression was finished. Next story Duplicate File Finder Remover 5.1 – Find duplicate files. Previous story LaunchControl 1.37 – Create, manage, and debug launchd(8) services. PDF Squeezer 3.7.1 – Simple-to-use PDF compression tool. PDF Squeezer 3.4.4 – Simple-to-use PDF compression tool. PDF Expert 2.3.2 – Read, annotate, fill, and sign PDF’s.